Perhaps born from the 18th century ‘Enlightenment’ mindset, motivated by the impulse to discover, collect, classify and ultimately gain a better understanding of the natural world, the human fascination with naturally occurring phenomena, the abnormal and anything considered ‘freak’, became especially popular during the 19th century. The appetite for viewing and amassing collections remained undiminished from previous centuries, however the thirst for greater knowledge and to inform was now rivalled in some circles by the desire to shock and amaze. In addition to the traveling fairs which had formally been the primary source of such wonderment, there now appeared more permanent exhibitions such as at ‘The Egyptian Hall’ in London and ‘P. T. Barnum’s American Museum’, in New York. Naturally the huge popularity of these eclectic displays of the weird and the wonderful combined with the already considerable interest in such exhibits contributed to the desire to either form, or add to existing private collections, the owners often gaining some notoriety in addition to creating advantageous social opportunities to inform, amaze and delight visitors. 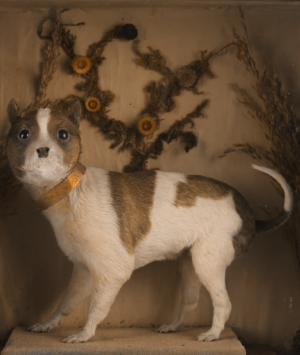 It should perhaps be mentioned that the art of taxidermy had become extremely popular at this time, not only in terms of fashionable decoration, but also powerfully symbolizing the Victorian perception of man’s mastery over animals and the world in general. 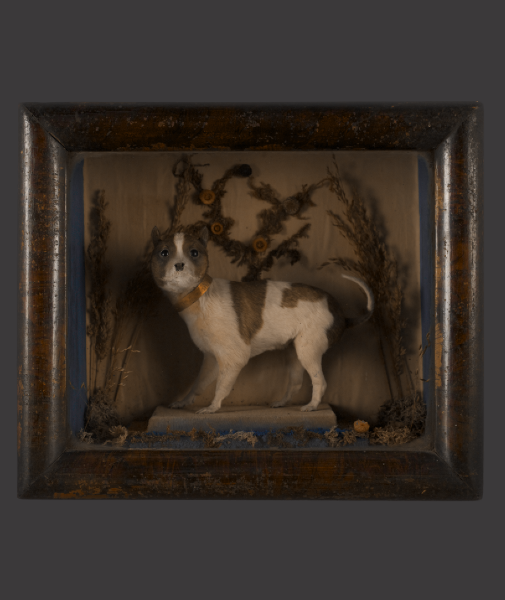 An amalgamation of these interests is evident in the shocking, grotesque animal ‘chimeras’ which were created and amazing miniature animals such as dogs which were preserved. Produced not only by provincial taxidermists but by leading artisans such as Henry Ward, who had worked with the noted American naturalist, John James Audubon and was father and mentor to the renowned taxidermist Rowland Ward. 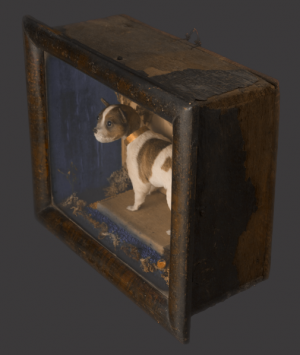 The miniature dogs proved especially popular, being entirely convincing as they were in fact usually real dogs of very young age and belonging to species of naturally small stature. 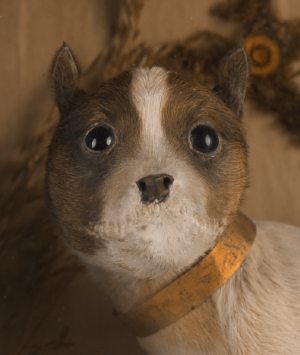 They were skilfully preserved and displayed as adults, often within cased dioramas or under glass domes. Many were sold to public exhibitions, to amateur natural historians and private ‘curiosity’ collectors, often marketed and displayed as, ‘The Smallest Dog in the World’. This fine example is mounted in its original display case with wire loop for wall hanging.